It all started, historically speaking, with good ‘ol dirt clay (ceramics). Then there was a non-pottery glass clay in ancient Egypt called faience which was used as a substitute for turquoise and to make beads and inlays. 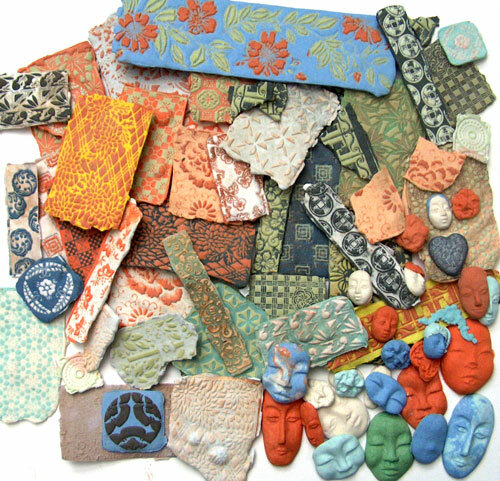 In recent centuries, we’ve seen the rise of polymer clay, starting with Bakelite and other brands that are now in common use such as Premo, Kato Polyclay, FIMO, Cernit, Pardo and others. There are also metal clays such as PMC (Precious Metal Clay) and ACS (Art Clay Silver) and metals such as silver, gold, platinum, copper bronze and steel mixed with an organic binder and water. Now there are also brands of glass clay on the market, which are made of powdered glass (frit) mixed with an organic binder and water. My friend Mad Margie, who melts things, invited several friends over to have a Play Day with glass clay last week. She’s worked in fused glass for several years and taken classes locally and in Las Vegas. We both share a love of beading and dyeing and color in general. Our Hostess with the Mostess valiantly mixed up many little jars of methylcellulose, water, and frit–she happens to have a LOT of colors in her glass studio–and we had at them for two days. We also used a sampler kit of another brand of glass clay from Alaska that had a very different consistency from the ones that were mixed from Margie’s frit. It was more pliable and held detail much better when used in molds. The frit mixes were much easier to use in the flat pieces- It was great to have both to experiment with! I even tried a millifiore cane, but I haven’t sliced it open yet. It had the consistancy of caning with cookiedough; I doubt that it will a crisply detailed cane but we’ll see! The results of the two-day spree were very interesting but not yet finalized. 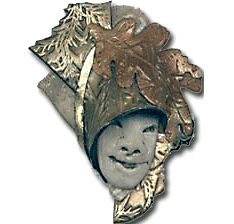 We used molds and also created thin sheets of flat patterned glass clay with a technique I recognized right away as being used with polymer clay as well. 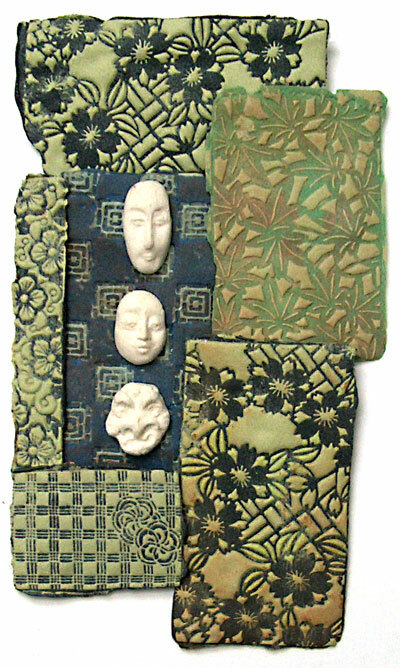 Lisa Pavelka has publicized this as the “Sutton Slice” in which clay of one color is worked into a rubber stamp like the ones I’ve had made at Ready Stamp with copyright free images from the Dover Pictorial Archive. The unfired clay is then sliced/cleaned to remove it from the surface of the stamp leaving only the recesses filled. Another color of clay is laid over that, and then the clay is removed from the stamp. With polymer clay, it is best to treat the rubber stamp first with a release agent like powder, corn starch, water or oil (I use Burts Bee balm, which has an olive oil base). With glass clay, you don’t need any of that, you freeze the piece. Our group used a chunk of dry ice in a cooler. 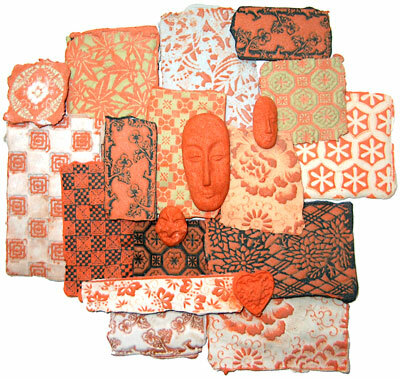 Then, when the clay is frozen, it is peeled from the stamp and left to dry. We used teflon sheets in a dehydrator to do ours–paper stuck to the clay, and the bare shelves left too much texture when the drying clay slumped through the holes! Now it is time to cut the sheets into shapes, file the edges and put them and the molded pieces into the kiln to be fused. The colors will change a lot as the glass powder melts and the cellulose burns out. I will probably top the flat sheets pieces with clear glass cut to match–I do like shine–and make them into pendants, beads, and mixed media pieces with metal. But that’s all work to be done in days ahead, and I will post pictures when its all done!